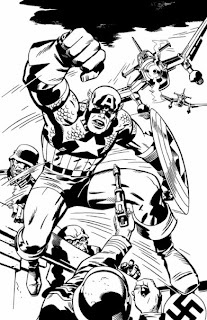 Today would have been Jack Kirby's 92nd birthday. To honor the day, we once again asked comic book creators from the Mid-Ohio-Con family and beyond to answer the question "Why is Kirby King?" Their responses appear below, along with some of our favorite panels of Kirby's art. Happy Birthday, Jack. Long Live the King! The "Spectrum" art show is slated to begin at the Society of Illustrators in Manhattan as per below, with an opening reception September 11th, 2009. However, I'm very pleased that a percentage of proceeds from the event will be going to a good cause-- the "Leukemia and Lymphoma Society--Light the Night" event. My Grandmother, Maw Maw, survived colon cancer and lived another 15 spunky years, and my Mom has survived breast cancer twice... strong women, who both went through so much. So.... I do of course applaud the Society of Illustrators for setting aside monies and efforts to celebrate and commemorate the lives of those touched by cancer. Consider going to the opening... A great night surrounded by beauty and like-minded people. :-) Give to a good cause. And at the same time, remember the other's that the date September 11th brings to mind. What better way than to "light the night" with hope. --Opening Reception on Sept. 11th Helps "Light the Night"
New York--"Spectrum: The Exhibition" is once again being mounted at The Society of Illustrators in Manhattan, this time, with renowned illustrator and storyteller Michael Golden adding to the kaleidoscope of talent featured in this stellar event, subtitled: "The Best in Contemporary Fantastic Art." Schedule for display September 1st-October 17th, "Spectrum: The Exhibition," will feature select works culled from Spectrum's yearly publication of fine art in the advertising and illustration world. Michael's piece for inclusion this year is his award winning piece, "Rush Hour," for original client Upper Deck, and art director, Mark Irwin. The opening reception for the event takes place Friday, September 11 at 6 p.m. Admission is $40. non-members, and $35. for members. Complimentary refreshments will be served until 8 p.m.
A percentage of the proceeds from this exhibit will be donated to the Leukemia and Lymphoma Society's "Light the Night Walk"--a nation-wide two to three mile evening fundraising walk during which participants carry illuminated balloons to celebrate and commemorate lives touched by cancer. Of course the Reception is not to be missed either, as artists and members celebrate what is so wonderful about the field of illustration. The Society is, afterall, the perfect place for such a celebration. 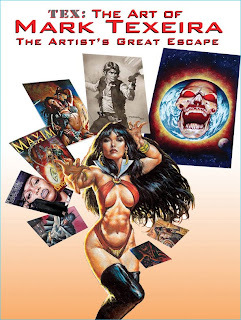 Their past members have included the likes of Rockwell,Parrish, Lyndecker, Flagg and more, with current members such as Michael Kaluta, Frank Frazetta, Joe Jusko, Bill Sienkiewcz, Mark Texeira and many many more! Think of “Ghost Rider,” "Wolverine," "Punisher," "Pscythe," “Moonknight,” “Black Panther,” “Conan,” “Vampirella,” and you think of Mark Texeira and his body of amazing work! A massive 128 pages, the color art book from Vanguard Productions showcases all this and more, with a study of Texeira's classical painting techniques applied to his old world portraiture work, as well as showing how his talent is coupled with modern sequential art to great effect. 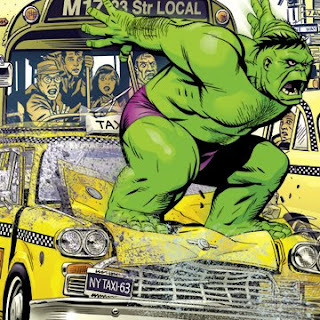 In fact, "Tex: The Art of Mark Texeira--The Artist's Great Escape," is a lush retrospective of the Mark's whole career--from his beginnings in the hard streets of NYC to his rise in the competitive world of commercial illustration. Written by Renee Witterstaetter, with additional research by Patricia Snodgrass, the new book is available in softcover, hardcover and deluxe slipcased hardcover--the later with an additional 16 page portfolio section. This is the third in a series for writer Renee Witterstaetter when it comes to art books. Her "Excess: The Art of Michael Golden," sold out in hardcover last year and is now only available in softcover, preceded by "The Fantastic Art," all published by David Spurlock of Vanguard Producitons. Welcome to the start up of my new blog page here at blogspot.com. In this space I hope to keep everyone updated on the appearances and projects of the creative folks I work with at Eva Ink Artist Group, and also keep you updated on my own creative freelance endeavors! In addition, I'll be posting some observances and essays and other meanderings along the way, harkening back to my "Witterstaetter's Witticisms" days! You who read my books back at Marvel Comics know what I mean! Looking forward to communicating with you all and sharing some positive thoughts along the way.